CCHQ has just announced that Samantha Cameron has gone into labour. 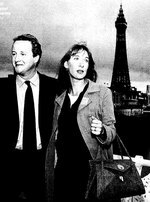 ConservativeHome wishes Mr and Mrs Cameron the very best as they await arrival of their third child. If the baby is born in the next few hours – their Valentine’s Day baby – it raises the question of who will deputise for the Tory leader at PMQs tomorrow. With William Hague and George Osborne in the USA the obvious candidates are Theresa May, Shadow Leader of the House, or David Davis, as the next most senior frontbencher. Update: Samantha gives birth to her third and as yet un-named child – a healthy baby boy weighing 7lb 13oz. David Cameron will take a week of paternity leave, followed by another week shortly afterwards. William Hague will step in for Prime Minister’s Questions tomorrow, before heading to Washington at which point David Davis is said to become acting-leader. Please continue to use this post to send the Cameron family your congratulations.